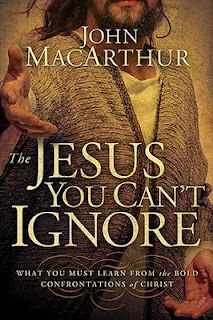 Book Review: "The Jesus You Can't Ignore"
“The Jesus You Can’t Ignore” is a very informative book. I learned much from his discussion of the various Bible texts in which Jesus confronted the Jewish establishment. However, MacArthur writes from an Evangelical perspective. His main purpose in writing this book is to encourage the Evangelical community to not back down from religious debate. He wants them to condemn false teachers and false teachings more and stand up for what is right. In his Epilogue, MacArthur does caution against “judging the secrets of men’s hearts – their motives, their private thoughts, or their hidden intentions.” However, he maintains that “people who actively teach serious error – especially doctrines that corrupt vital gospel truth – are to be confronted and opposed.” This creates some problems. As a Roman Catholic, I view MacArthur as a brother Christian, someone who I do not agree with totally, obviously, but a fellow Christian who is working for the kingdom of God. I feel that he is in error with some of his beliefs, but I trust that God will sort all that out. He feels that I am someone to be “confronted and opposed.” I believe I am right about my faith as much as he feels he is right about his. Neither one of us is going to win that battle. This is a book well worth reading, but it is important to know MacArthur’s purpose in writing before delving in. "Will I See My Dog in Heaven?" 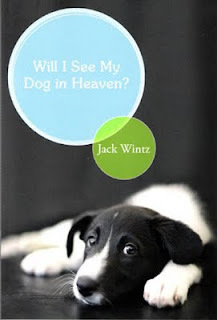 I haven't read Will I See My Dog In Heaven by Fr. Jack Wintz, but the title caught my eye and I read the review of it in St. Anthony Messenger. It is a common question, especially for those of us who love our pets. The big theologians say "No," that our beloved furry friends don't have free will and therefore cannot choose God and aren't granted access into the beatific vision. Well, that is one way to look at it and it is a reasoned argument. But seeing as none of us know for sure, I tend to agree with Fr. Wintz that the answer is "Yes." Anyone who looks into an animal's eyes knows that they have a soul. They were created by God and God proclaimed his creation "good." Why would he not extend that creation into the next world? Per Barbara Beckwith's Review, "Father Jack argues that God would not suddenly stop caring for the creatures he had called "very good" and put into existence with great care in the Garden of Eden. He would want them with him in 'the restored garden' of heaven." He also tells of St. Francis "who always thought of animals as his brothers and sisters and acted accordingly, like with the wolf of Gubbio. St. Francis put animals into the Christmas scene at Greccio because he firmly believed that Jesus came for their sake as well as ours." This is the 4th Anniversary of when I started this blog. Many thanks to those of you who have shared this journey with me. Whether you have been a faithful reader or an occasional visitor, I greatly appreciate your welcoming me into your life. I hope that this blog will continue to be a source of information and inspiration for those who happen upon this small corner of cyberspace. Homeschooling has been many things - difficult, delightful, exhausting, enlightening, boring, brilliant, and constant - but it has not always provided me with the cultural validation that I seem to crave. Intellectually, I know that my choice to stay home with these people was the right one - worthy, fulfilling, and successful. Emotionally, however, I react to a culture that doesn't really value mothering - a culture that asks "What do you do?" Hartman goes on to describe how she was jealous of a friend of hers who was so successful - who worked and had a family and did both well (I know I have been there), but then she comes to find out that this friend is actually envious of her life. I laughed and told her of my own envy. It seems almost petty now, a decade later, but that was all that I needed. To have her - or anyone outside my family - see the value of my work, the beauty in it, re-energized me and reminded me why I was where I was . . . Both [my friend] and I came away from that night seeing the value and the beauty in our own choices, and we were both better for it. My own mantra about families is that God gives them to us so we learn how to spend a lifetime loving people we wouldn't necessarily choose as friends. I just returned from my parish’s centennial celebration. The honorary chair for the evening was a former mayor of our city and lifelong member of our parish. Now in his eighties, he told a story of an event that happened seventy-five years ago! He was a little boy preparing for his first communion. It was a big deal for the pastor of the parish to come visit his classroom. Every one tried to do his very best and be on his best behavior. On one such occasion, Father asked for a volunteer to lead the “Our Father.” The future public servant eagerly raised his hand and was called up in front of the class. The pastor and the class waited expectantly for the prayer to begin. Unfortunately, stage fright overtook the little boy and he forgot all the words. His mind completely went blank. As he said, the priest could have done any number of things. He could have made an example of him in front of the class. He could have reprimanded him for not knowing his prayers. He could have called someone else up. Did the priest do any of these things? No. What he did do was whisper the words behind him so that he could say the prayer and no one was any the wiser. This was such a small kindness, yet seventy-five years later, an old man still remembers it and willingly shared it with a large crowd of people. Mother Teresa said that “We can not do great things. We can only do little things with great love.” She also preached the five finger gospel with one of the following words represented on each finger: “You did it to me.” She reminds us of the words in the Gospel of Matthew that whatever we do to the least of our brothers, we do to Jesus. So often in life, it is the little things that matter. Most of us do not lead lives which change the world on a large scale. Rather, we live quiet lives in which we touch a select few – our families, our friends, our neighbors and co-workers, and those we encounter simply going about the business of our daily lives. Yet, how we treat those people we do come in contact with can make a huge difference. Do we respond to our family members with kindness and love or do we treat them with impatience and frustration? Do we help our co-workers and do our work with a cheerful spirit or do we complain? Are we good neighbors to those who live around us? Do we treat those who serve us at the grocery store or the bank or a restaurant with respect or do we grouse at them and treat them badly? Every day we have the opportunity to make a difference in someone’s life. We can share a smile, give a hug, and spend time with a child. We can feed the hungry and give drink to the thirsty and do so with a cheerful heart. We can give of ourselves and make someone else’s day a little bit brighter. We can remember as Jesus said, and Mother Teresa reminds us, that little things done with great love are little things done for Jesus. They may not be remembered in the big scheme of things, but God will know. Then again, it just may be that a simple act of kindness may change the life of another person and will be recalled three-quarters of a century from now! Little things do matter an awful lot. In the October 2009 issue of US Catholic, Paul Wilkes shares his experience of giving communion at a hospital. He speaks about being a minister of the Church and extending Jesus' body to all he can. This reminded me of when I was in the hospital giving birth to my own children. For my first child, I went to a Catholic hospital. I was there for four days. No one ever brought me communion. I didn't realize I was missing anything. With my second child, I was at a secular hospital and someone came to bring me Communion every day. What a great comfort that was to me. I don't remember who the people were who came to see me, but they truly brought joy to me. I'm very thankful for them. I'm Right Next to Scott Hahn! No, not literally. But my book is. I went to visit the library at my alma mater yesterday and just for fun searched to find my book Letters to Mary from a Young Mother on the shelves. There it was, sitting right next to Scott Hahn's Hail, Holy Queen . I got quite a kick of that! My book is keeping very good company! It's a popular adage that practice makes perfect. I say that to my children all the time. The past couple days, I have encountered two reminders that this is, in fact, true. No matter what we are trying to accomplish in life, we need to put in the time to make it a reality. The first reminder came in reading Writer's Digest. Joshua Henkin wrote "Some of my worst work was produced under the influence of inspiration, and some of my best work was produced when I was feeling least inspired. Pack your lunch pail and go to work. Tie yourself to your chair. That's how you become a writer." As a writer, I can vouch for the truth of that statement. Every Sunday night I write a column. While I keep my eyes open for a source of inspiration it is not always easy to find. Many weeks there are desperate pleas to the Holy Spirit. My columns are not always great, I know, but I do somehow find the words each week and hope that the Holy Spirit helps them do the work that they should. The same holds true for the spiritual life. If we want to be a person of God, deeply rooted in prayer and faith, then we need to do the work. Alton Pelowski, writing in Columbia Magazine compares living the Christian life to running a marathon. "A training schedule for a marathon mirrors the advice of the saints, in that it starts out slowly and gradually increases in its demand. If a novice runner attempts to run a long distance without training, or a young Christian attempts to pray for extended periods and perform heroic acts without ever having done so, the feat often proves too formidable, and the goal is seen as not worth the effort. "On the other hand, if one does take the necessary time to train - and not just talk about it - then longer distances become easier with each successive week. In the same way, St. Thomas Aquinas and others have explained that when we come to possess the virtues, which rightly order our actions in thought and deed, then doing good becomes natural and seemingly effortless." Anything we want to do well in life, we need to practice. That includes our faith. Today I overheard a very interesting conversation regarding the Sacrament of Confirmation. Two women, both involved in religious education, were discussing whether teenagers should be made to make their confirmation. They both agreed that they should. They felt that it was part of the responsibility of the parents to make sure this happens. They promised to raise their children in the faith at Baptism. This is the culmination of that process. I admit, this is not how I ever looked at this particular sacrament. I understand their position, but I have always been staunchly of the opinion that Confirmation needs to be freely chosen by the candidate. It needs to be that person’s commitment to the faith. In our current culture, children are brought forth for Baptism at an early age. My own children were both less than two months old. Yes, I made that commitment for them. I promised to raise them as a Catholics and to teach them the faith. My older son now receives Communion and goes to Reconciliation regularly. He was excited to have the opportunity to do so. My younger son will be receiving those sacraments this year and is also very excited. I hold out hope that when the time comes for them to make their Confirmation, they will be ready to make that personal commitment to the faith. I truly believe that part of the issue surrounding Confirmation is the age at which it is conferred. In the United States, the Bishops have the discretion to administer the sacrament anywhere between the age of seven and seventeen (obviously, adults can also receive the sacrament). In my own Diocese, the tradition has long been to confer Confirmation during the Junior year of High School when a young person is sixteen or seventeen. The thinking is that a young person is nearly grown and capable of making an adult commitment. A person can also receive a driver’s license at that age, thereby allowing them to take personal responsibility for mass attendance. A young person should have been in Catholic School or attended religious education for a number of years by this time and understand the faith. The logic is good. The reality, however, is that the majority of young people of that age are in an all out authority rebellion. It is part of the natural process of things. Young people are attempting to spread their wings and figure out what they stand for. It is a time of questioning and searching. These same young people, however, might have been very ready and willing to make that commitment to the faith at a younger age. Such a commitment would have allowed them to receive the added help of the Holy Spirit, help that could be quite beneficial as a young person navigates the challenging teen years. The Catechism of the Catholic Church states that “every baptized person not yet confirmed can and should receive the sacrament of Confirmation. . . .Although Confirmation is sometimes called the ‘sacrament of Christian maturity,’ we must not confuse adult faith with the adult age of natural growth, nor forget that the baptismal grace is a grace of free, unmerited election and does not need ‘ratification’ to become effective. St. Thomas reminds us of this: ‘Age of body does not determine age of soul.’” (CCC 1306,1308) The Catechism goes on to state that “catechesis for Confirmation should strive to awaken a sense of belonging to the Church of Jesus Christ, the universal Church as well as the parish community” (CCC 1309). Children who have reached the age of reason and have been brought up in the faith can certainly understand that sense of belonging. Why is our Church denying this opportunity for grace to children who want it and are ready for it? Perhaps if the Church extended the opportunity for Confirmation to these younger children, with the understanding that it would need to be the child that wanted it, the issue of whether or not parents needed to make teenagers receive the sacrament would cease to exist. 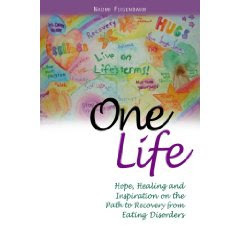 The title of this book “One Life” comes from a statement that one of Naomi’s therapists makes, “You only have one life; don’t waste it on an eating disorder.” Each chapter in the book corresponds to one week of her treatment. Naomi begins each chapter with a skill for recovering anorexics to work on. She lists the skill, how to use this skill, and when to use it. The skills run the gamut from Being Honest to Using Your Voice to Reaching Out to Others and Relinquishing Control. These are useful skills for everyone to have. “One Life” should be required reading for anyone touched by an eating disorder. I would particularly recommend it for parents who have a child struggling with an eating disorder. It provides a valuable window to what is going on in the mind of someone struggling with this. Thank you, Naomi, for writing this book. Just as artists long to paint one masterpiece among their many works, so Jesus made his mother to be his greatest masterpiece. - Scott Hahn, "Hail Holy Queen"
Lucado explores the very real fears that we do have and offers God’s word to help allay those fears. He examines the fear of not being worth anything, the fear of disappointing God, of not having enough, of not protecting one’s children, of facing challenges, of violence, of death, and fearing that maybe our faith is all for nothing, that maybe there really isn’t a God at all. Through it all, Lucado does not sugarcoat the reality of life. Perhaps that is the most refreshing quality of this book. He does not promise that all will be well simply if we believe in Jesus. He knows that is not the case. True believers still encounter all the evil that the world has to offer. What Lucado does do is encourage readers to lean on God through it all, to give Him our fear and trust that God knows what He is doing. 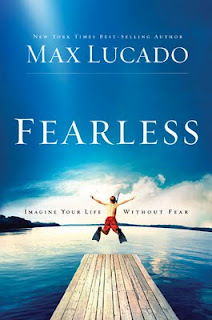 Lucado writes, “real courage embraces the twin realities of current difficulty and ultimate triumph. Yes, life stinks. But it won’t forever. As one of my friends likes to say, ‘Everything will work out in the end. If it’s not working out, it’s not the end.’” He maintains that difficulties have a different purpose when viewed from an eternal perspective. “What makes no sense in this life will make perfect sense in the next.” He compares this world to life in our mother’s womb. A lot of things were going on there that no doubt made no sense to us and served no real purpose in utero. Yet, they existed for life in this world. The same will hold true for what we encounter now and life in the next. We have no need to fear. We are in good hands. There once was a little boy who loved a soft blue teddy bear and a plush green goose with all of his heart. They went with him everywhere he went, tucked safely under his arm. Like the velveteen rabbit, they showed signs of the little boy’s love. The bear especially wore his wounds as badges of honor. From his patched up eye and nose to the many surgeries necessary to keep his body put together, that bear was literally loved to pieces. One day, the little boy lost his favorite stuffed friends. The search was frantic. The tears were many. The house and car were searched from top to bottom to no avail. The little boy curled up into a ball, inconsolable. Where could they have gone? A prayer to St. Anthony finally led to the missing toys. They were sitting on the bottom of the slide where they were left when his friend next door invited him over to play. The little boy ran out to them, scooped them in his arms and kissed them with all his might. What was lost had been found and there was indeed great rejoicing. Chapter 15 of The Gospel of Luke shares three parables of items lost and found: the lost sheep, the lost drachma, and the lost (prodigal) son. In each case an item of great value is lost. Great sorrow and searching ensues, followed by celebration when the item is found. We all know the experience of loss. Whether it is a child losing a favorite toy, a worker searching for a misplaced paycheck, a mother searching frantically for a child who has wandered away in a department store, or a person missing a long-lost friend, we all know what it means to be sick with fright and worry over something missing. We are not the same until the missing something is returned to us. When it is, we want to celebrate! We share the news with all who are within earshot! What we lost has been found! Come share in our joy! And so it is with God. Like the Good Shepherd, the woman searching for her lost coin, and the prodigal son’s father, God searches for us when we are lost. He knows the state of our hearts and waits eagerly for us to return when we stray away. When we do, there is great celebration! Like the little boy squeezing his stuffed friends tightly, God holds on to us with joy and welcomes us back into the fold. There is much rejoicing in heaven! May we give them cause to celebrate! This is the year for priests - June 19, 2009 - June 19, 2010.
vital to the faith of your people. pray for us and for all our priests.